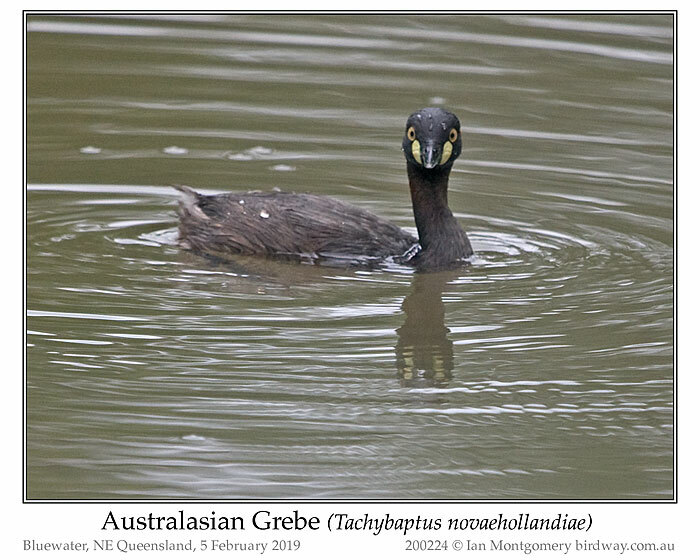 Now this really is a bird of the moment given the recent floods in Townsville generally and Bluewater in particular where I live. On Tuesday morning I went down to the area below the flood bank to check out the damage from the third flash flood that had occurred the night before. Compared with neighbours who have had their houses and businesses flooded I have got off very lightly but nonetheless the mess made by the floods is a bit sad: carefully nurtured native trees torn up or flattened and lots of flotsam such as trees, branches, tangled fence wires and other debris. Between floods there has been a persistent knee-deep pond at the bottom of the flood bank below the house (above) and to my delight I found this Australasian Grebe had taken up residence, a good place to be as small fish normally get trapped in this area after floods. It was still there when I returned from the house with my camera. In the second grebe photo, it has just surfaced after a dive and you can see the way grebe legs are attached at the very rear of the body. Very good for swimming and diving, the original outboard motor, but fairly useless for walking on land. Unsurprisingly grebes stay almost permanently on water and build floating nests. The grebe didn’t seem very pleased to see me, third grebe photo, so I left it in peace and when I went down the back again on Wednesday it had moved on and the water levels were dropping. The colours don’t show very well in the current gloomy overcast weather but my visitor was in breeding plumage: generally dark grey with a rufous patch behind the cheeks extending onto the sides of the neck. The fourth grebe photo shows a different bird in breeding plumage just before sunset which, if anything, exaggerates the colours but we are allowed a little artistic license. The fifth grebe photo show one in non-breeding garb. Not only has the plumage changed but the bill is pale too and the patches on the gape look smaller and have lost their yellowish hue. Both sexes are similar in appearance in breeding and non-breeding plumage. 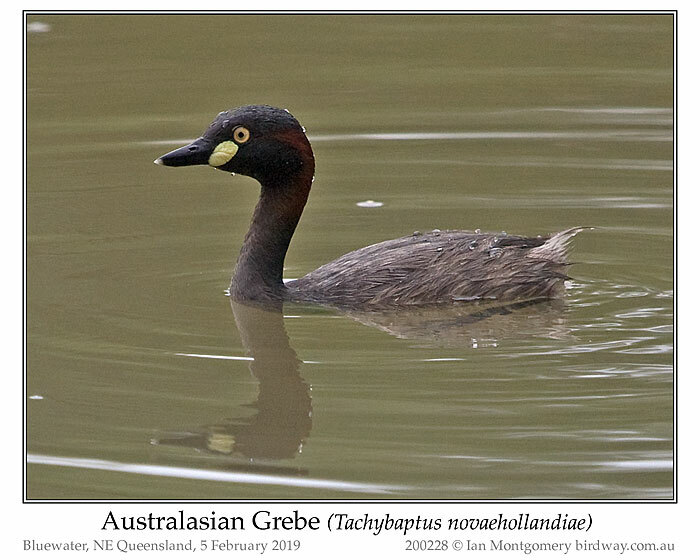 The Australasian Grebe has a prolonged breed season, August to April, and breeds opportunistically in response to good aquatic conditions. In the tropics they may breed at any time of the year. 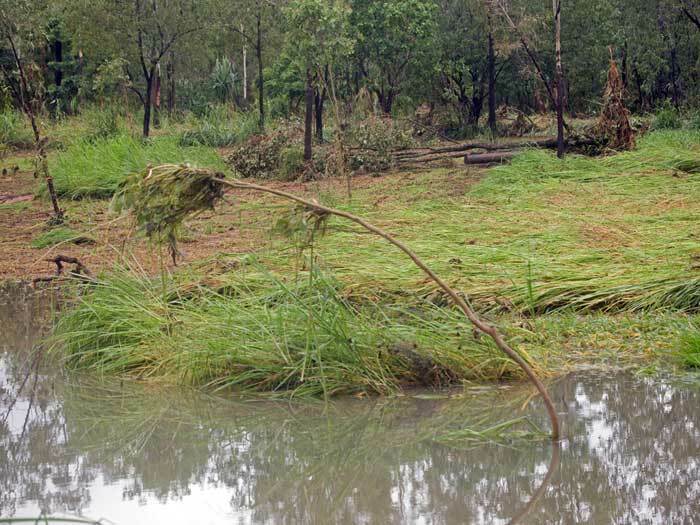 When breeding they prefer wetlands with well vegetated shores for cover. At other times they occur on a wide variety of mainly fresh permanent or semi-permanent wetlands and, as I’ve just discovered, on temporary floodwaters. They have benefitted from the building of small reservoirs and dams on farmland. 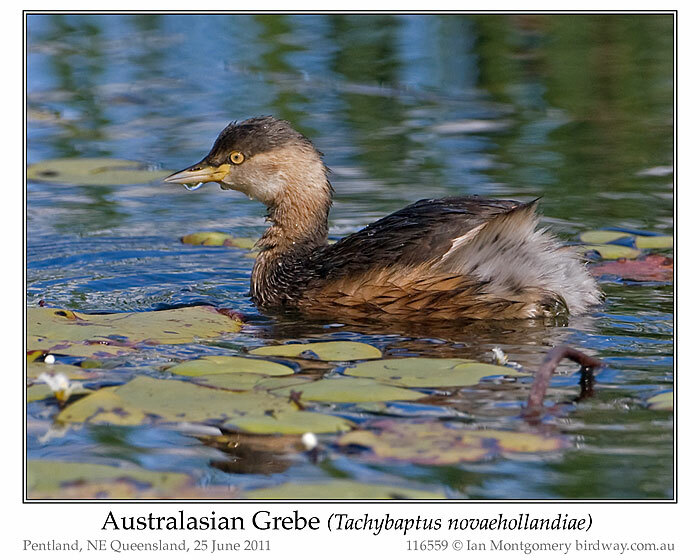 I haven’t got a photo of a nesting Australasian Grebe but above, sixth grebe photo, is one of the very closely related Little Grebe of Eurasian and Africa, which featured as bird of the moment in 2012. 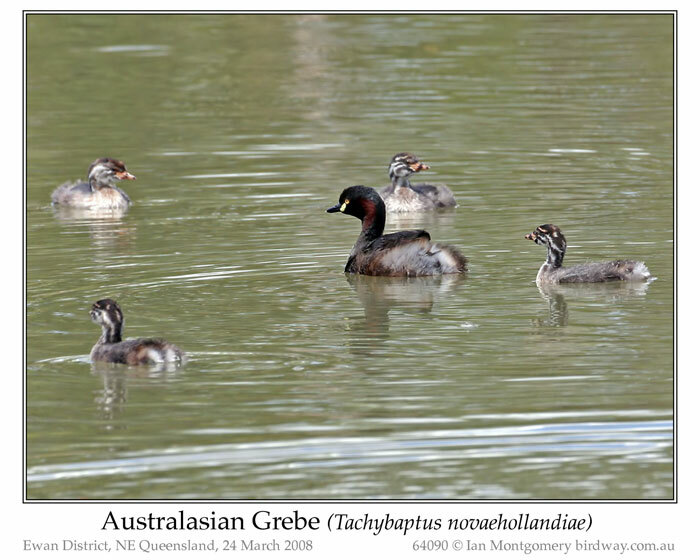 The seventh grebe photo shows a family of Australasian Grebes. The young birds, typically for grebes, are beautifully patterned and in the eighth grebe photo you can see the striped head and neck and red gape patches. Gape patch colours are clearly important in the life of grebes. Presumably red means ‘feed me’ and you can guess what yellow means. Grebes may lose out in the walking stakes and prefer diving to flying when disturbed. They, however, are remarkably strong fliers and can move long distances, usually at night. 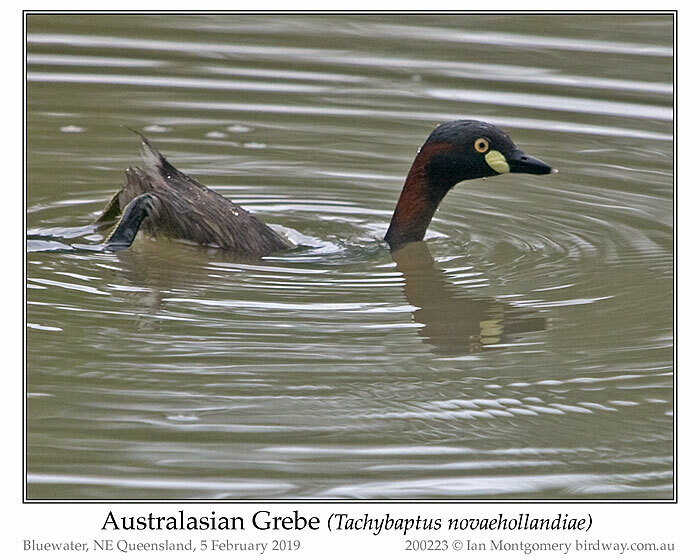 There is some uncertainty about seasonal movements of the Australasian Grebe in Australia but birds appear to move to the coast from arid regions during drought. It is widespread in Australia, though rare in Tasmania and also occurs in New Guinea, Timor, Java, the Solomons, Vanuatu and New Caledonia. The species colonised New Zealand in the 1970s. 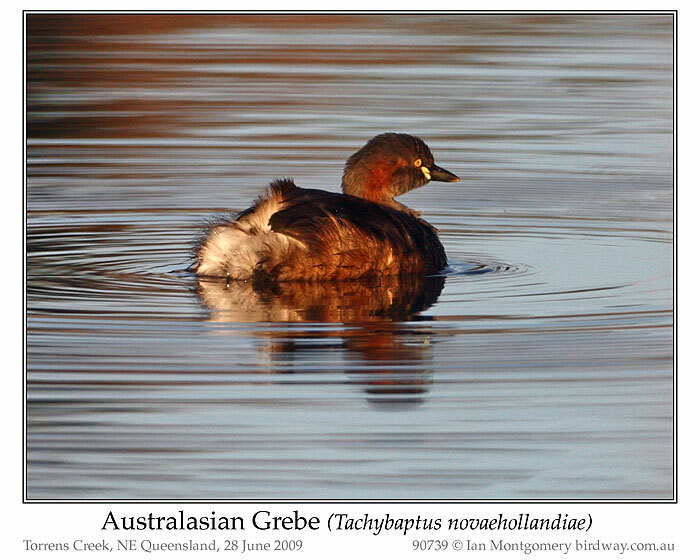 For a long time it was treated as a race of the very similar Little Grebe (above) but the ranges of the two species overlap without interbreeding in New Guinea. 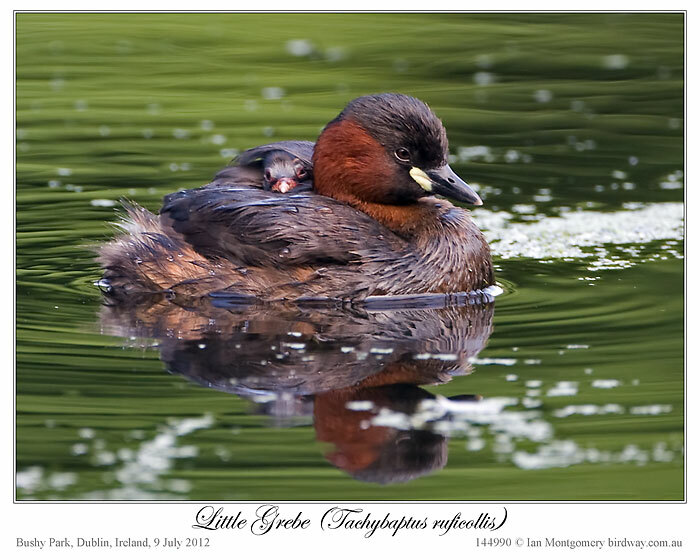 The Little Grebe occurs across Eurasia from Ireland through Europe, South and Southeast Asia to Japan and south to Java and Northern New Guinea. It also occurs widely across sub-Saharan Africa to South Africa and east to Madagascar. We are fortunate to appreciate the gifts that nature gives us. I went into town on the same day my welcome visitor arrived and was treated to the sight of a large flock of Royal Spoonbills feeding in a flooded park at Bushland Beach and a Wedge-tailed Eagle soaring over the highway near Black River on the way home. Well this newest addition from Ian surprised me. Maybe he is going to get back into the “Bird of the Week” routine like he used to produce. I have always enjoyed these newsletters from Ian. Very thankful that he gave me permission years ago to re-post them here. I have always enjoyed Grebes here. Of course, ours do not look like the ones he gets to see. 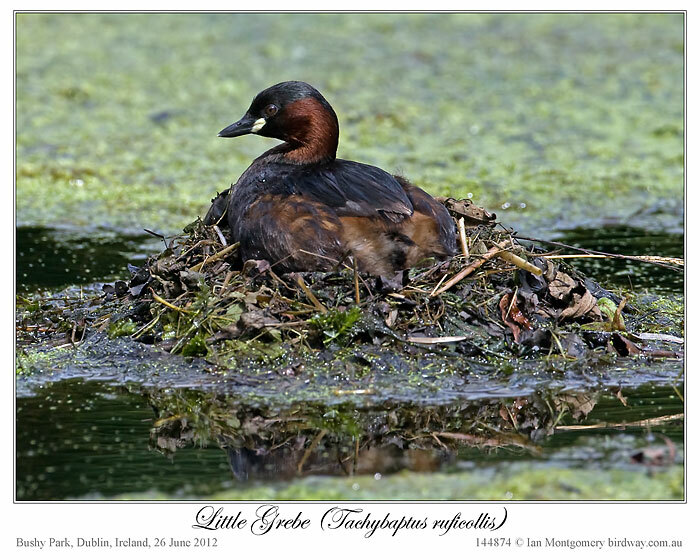 Ian said, “Unsurprisingly grebes stay almost permanently on water and build floating nests.” One would have to wade out to the nest in the verses I chose. 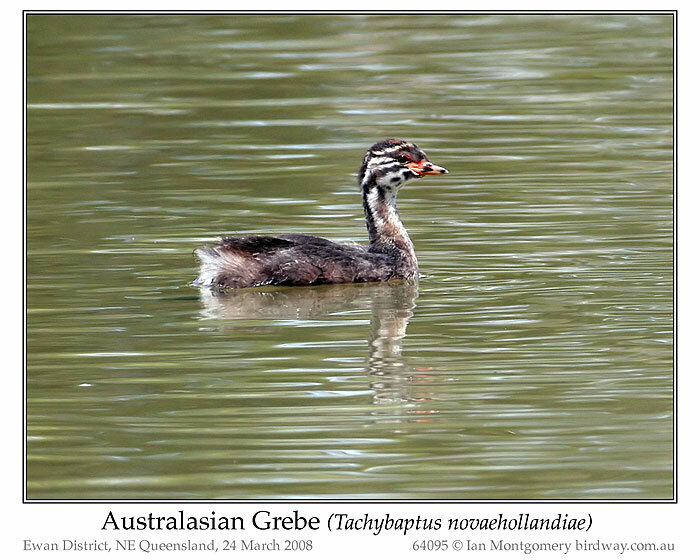 This entry was posted in Bird of the Week, Birds, Birdwatching, Christian and tagged Australia, Australian Grebe, Creation, Floods, Ian Montgomery, Little Grebe, Nature, Nesting, Photography, Townsville. Bookmark the permalink.